From the moment of his first EMS call as a paid on-call EMT in 2004, Brandon knew this career was his calling. Brandon came to MedStar in 2012 as a Paramedic. He moved up to Field Training Officer and eventually was selected for promotion to MedStar Mobile Integrated Healthcare (MIH) team as a Mobile Healthcare/Critical Care Paramedic in 2015. In this role, Brandon is responsible for managing high EMS system utilizers and patients at-risk for preventable 9-1-1 calls, hospital Emergency Department visits, and in-patient admissions. Brandon enjoys the tangible impact he has on the patients he treats. On the MIH team, that impact is not simply a 30- to 40-minute patient encounter, but helping his MIH-enrolled patients over the long term. “As a field Paramedic, I can make patients better, but as an MIH provider, I can help make them well,” he explains. 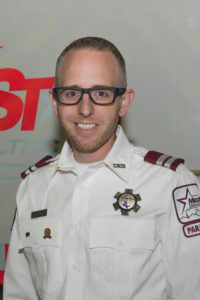 Brandon was a contributing author of the Community Paramedicine textbook and is a member of the NAEMT Community Paramedicine Curriculum Committee and the Critical Care Paramedic Advisory Committee for the International Board of Specialty Certifications. He has also presented at national EMS conferences such as EMS Today and EMS World, and he is a member of the Adult Protective Services of Tarrant County Community Board. Brandon recently graduated from the University of North Texas Health Science Center’s Geriatric Practice Leadership Institute, where he developed a new screening, assessment, and intervention process for fall-risk patients.